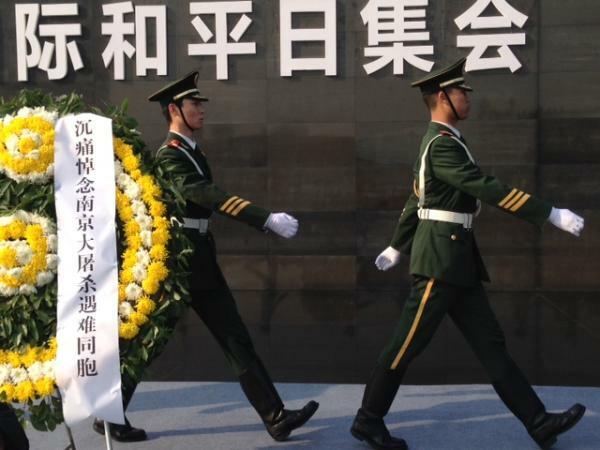 President Xi Jinping has presided over China’s first state commemoration of the Nanjing massacre. China says 300,000 civilians were massacred when Nanjing was occupied by Japan’s troops in 1937, although some Japanese nationalists dispute this. President Xi Jinping told survivors that to deny a crime was to repeat it but insisted the ceremony was to promote peace, not prolong hatred. Relations between China and Japan have been strained in recent years. They have clashed over island territory in the East China Sea as well as over Japan’s insistence on honoring its war dead, including convicted war criminals, at the Yasukuni shrine. The ceremony, which came on the 77th anniversary of the massacre, is part of three new public holidays intended to mark the conflict between the two countries. A crowd of about 10,000 people attended the event in Nanjing, taking part in a minute’s silence to honor those killed. They included survivors of the massacre, as well as soldiers and students. In a speech at the event, President Xi Jinping criticized Japanese nationalists for denying the atrocity took place. “Anyone who tries to deny the massacre will not be allowed by history, the souls of the 300,000 deceased victims, 1.3 billion Chinese people and all people loving peace and justice in the world,” the president said. Xi Jinping added that China should not “bear hatred against an entire nation just because a small minority of militarists launched aggressive wars,” according to the state-run Xinhua news agency. Millions of Chinese people were killed when Japan occupied China in the 1930s and 1940s.